We are just about to come from air from the busy July 4th(sparksday) and 7/07/07 promotion that we had. Thank you! Thank you! for all your continued support through your orders. We hope you are all having some summer fun playing with all your new stamps, papers and accessories. 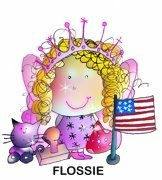 Meanwhile, as Joy and I were busy processing orders, my daughter, Samantha(10yrs), decided that she had to play with all these fun stamps that you have all been ordering. As she was helping to pick orders, these stamps just tempted her so here are her creations with a little inspiration and help from various blogs and SCS, too. Roll Stardust pen for the glitter. 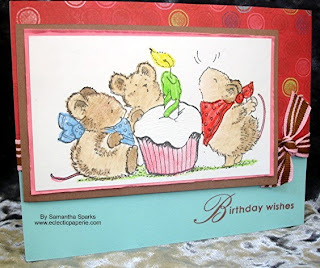 She made this card just so she could play with the Stampendous stamps. We actually went to "Miss Joy's" to stamp last week and take a little break. 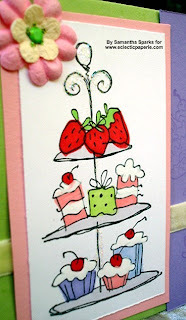 Joy also has this card up on her blog along with another cute Penny Black card sample. The paper here is Splendid from Fancy Pants and the greeting is from Paper Trey. Samantha was so excited about this card that she wouldn't let me see it till she was done. She came up with this one by herself including choosing the color combo and papers. She designed it for my sister-in-law who is left-handed and thought it would be fun to have the card open the opposite way than we are used to. She used the Jane and Girly Girl stamps. The patterned paper that she chose was from Chatterbox. 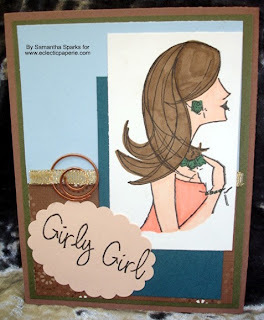 Of course all the solid cardstock was Stampin' Up! Who doesn't love all those SU colors and the heavyweight cardstock. We actually bought some Prismacolor art markers so that we have a chance to play with them. They are great because they do not streak and the colors are not just plentiful but vibrant. We now see what all the rave is about these markers. Stay tuned for the weekend. We will be off to CHA in a couple days to find more great things for the eP product mix. Oh shes a FABULOUS little stamper!!! 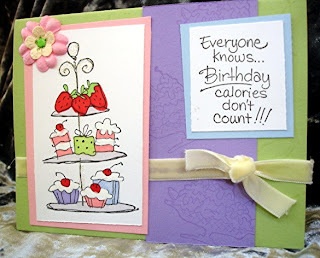 Wonderful cardmaker!!! Sam! I love your cards! You just make me smile all over ... even from so far away! I can see your smiling eyes! Keep up the great work!